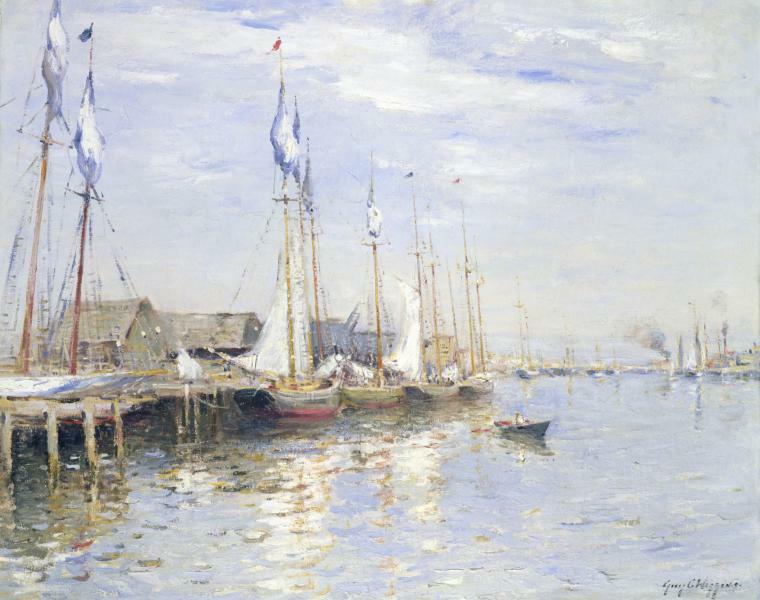 Guy Wiggins is often called the last great American Impressionist painter. 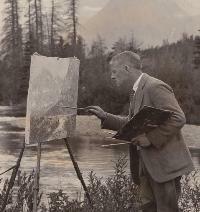 Wiggins was born in Brooklyn, New York in 1883, and mentored by his father, landscape painter Carleton Wiggins. Wiggins attended Brooklyn Polytechnic Institute, with the idea of becoming an architect, but continued his art education at the Art Students League and the National Academy of Design. Ironically, it was his paintings of Manhattan architecture that catapulted him to fame very early in his career. 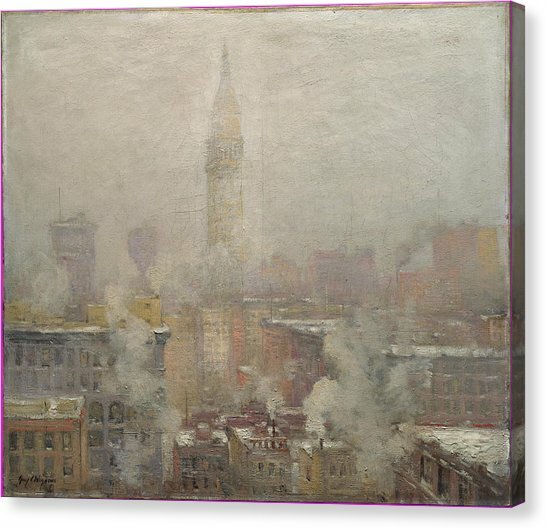 At the age of twenty, Wiggins became the youngest artist to have a work in the permanent collection of the Metropolitan Museum of Art, with the purchase of The Metropolitan Tower. Guy Wiggins spent much of his time painting landscapes, alongside his father and other fine artists, at the Old Lyme Art Colony in Old Lyme, Connecticut. 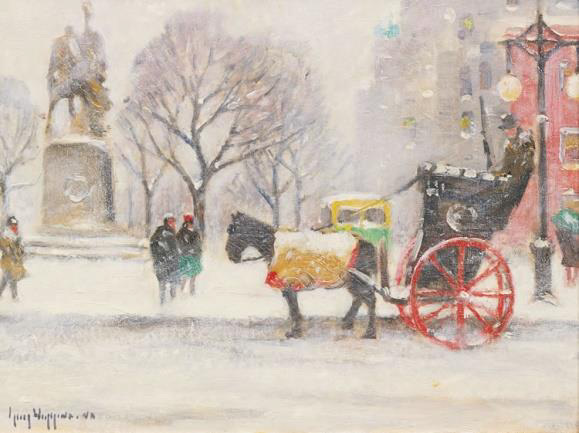 He was often commissioned to paint landscapes and portraits, but it was his winter scenes of New York that were most admired. 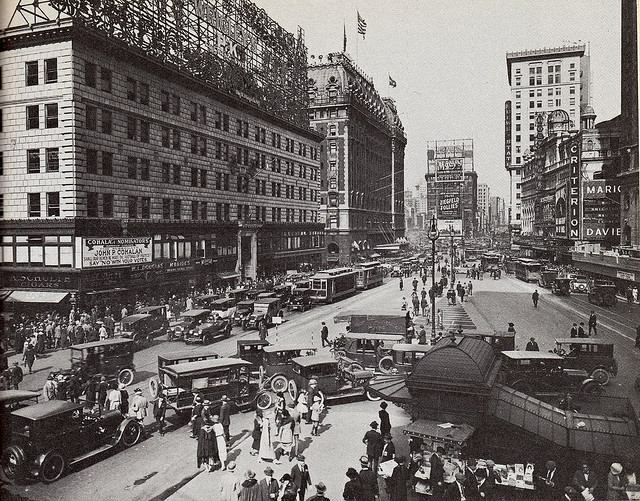 Around 1918 though 1928, after World War l and before the Great Depression, New York was a prosperous, bustling city, with new buildings and bridges going up, speakeasies taking up the slack of Prohibition and American artists creating their own styles, rather than looking to Europe for inspiration. Signed lower right: Guy Wiggins N.A. 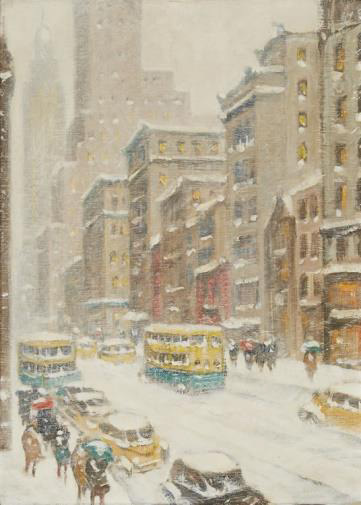 Guy Wiggins did much of his painting at his Connecticut home and wintered in St. Augustine, where he died in 1962, at age 80. Besides his work at the Met, Guy Wiggins’ work is part of the permanent collection of the Smithsonian American Art Museum, the Brooklyn Museum and the Art Institute of Chicago.  Please contact us if you would like more information about Snowstorm in Midtown Manhattan, Winter at Madison Square, Entrance to Central Park, Winter or any of the other fine art at the Surovek Gallery. Stan Shelley and Joette Humphrey. 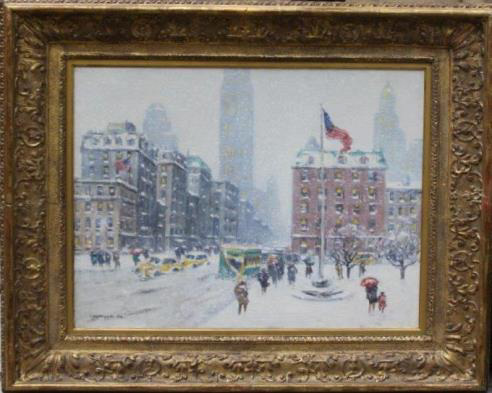 Antiques: Painter Guy C. Wiggins. BlueRidgeNow. March 19, 2015.